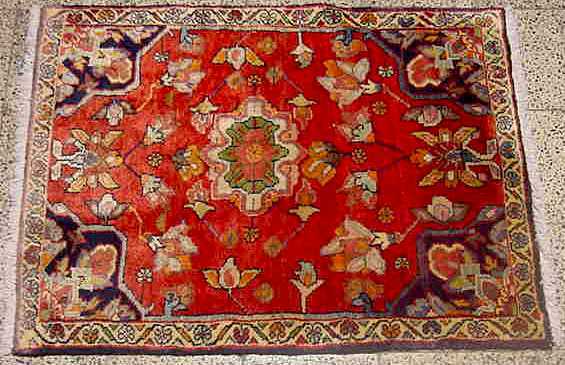 Traditionally Sirjan is a collection point for Afshar rugs. Sirjan is the main collection point for the large Afshar production area between Shiraz and Kerman. The city of Sirjan is located in the southwest corner of Kerman province. It is the second largest city of the province after Kerman. It is at the intersection of roads joining the 4 southern provinces which has helped Sirjan grow as a transportation and market center. Many of the people of the region are of Afshar ancestry. The Afshar were a principle tribe of the Oguz and were an important Kizil Bash tribe during the Safavid dynasty. They revolted in the late 16th century and Shah Abbas split them up to disperse their power. An Afshar, Nadir Khan Afshari, ruled Persia but his reign was so problem filled that his men killed him and the political power of the Afshar tribe was broken for good. 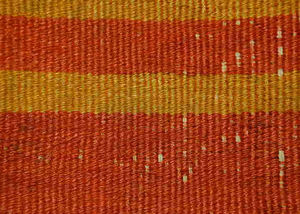 Weft: Cotton 1st & 3rd shot rigid, 2nd shot sinuous cotton. Selvages: overcast with red wool. 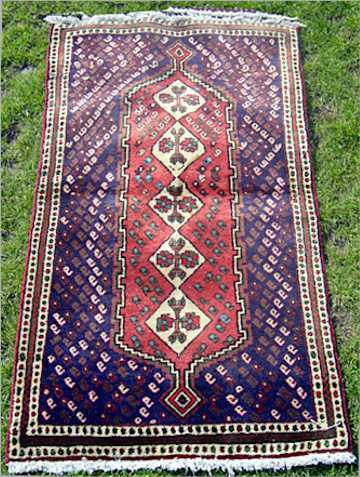 This is an Afshar rug from Sirjan. Sirjan is the main collection point for the large Afshar production area between Shiraz and Kerman. 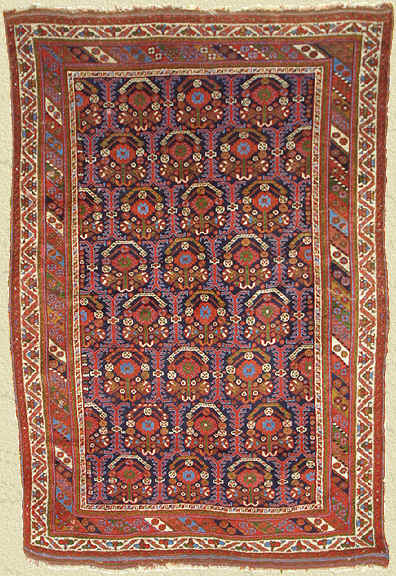 This rug is thick, durable, and uses the traditional pattern of the Sirjan area. 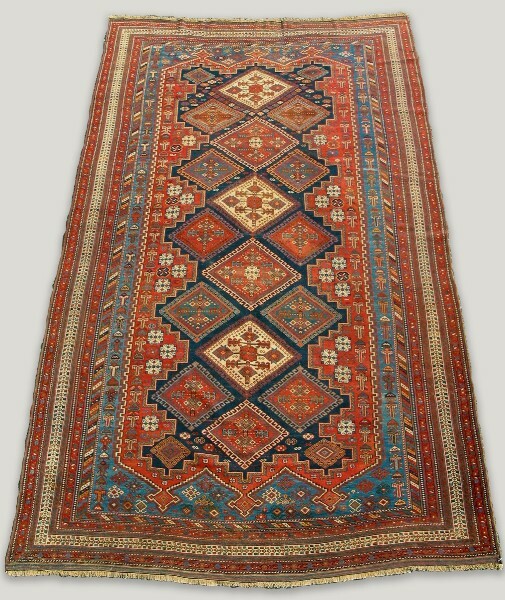 This size in an almost square format is traditional with this type of Afshar tribal rug. The Afshar were a principle tribe of the Oghuz and were an important Kizil Bash tribe during the Safavid dynasty. Nadir Khan Afshari ruled Persia but his reign was so problem filled that his men killed him and the political power of the Afshar tribe was split up. 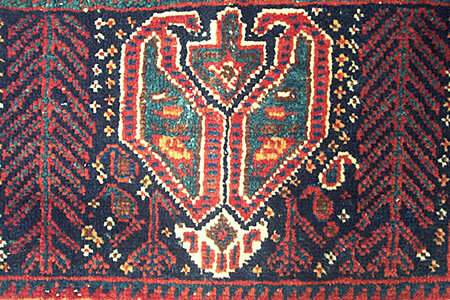 Sirjan Afshar Rug. Iran, 20th century. 6 foot 4 inch by 4 foot 11 inch. Further Notes: Thick meaty handle, very substantial new rug. No holes, tears, rips or low spots. Very long pile. 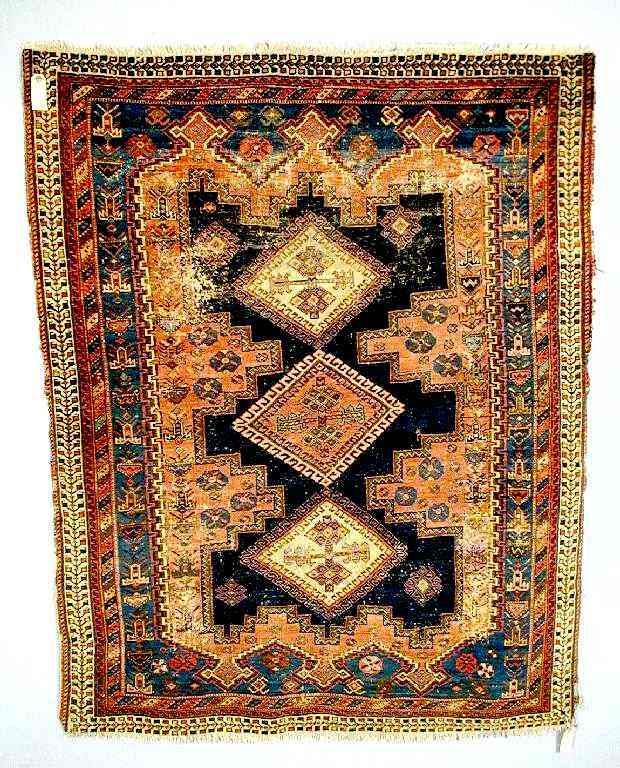 Afshar flatwoven ru-korssi, south Persia, Sirjan district about 1900-20,3ft.7in. 1.09m. sq. Slight wear to plainweave centre, three small patches, small stain. Soufreh is one of a number of western spellings, including sofreh, soffrai etc. of the Persian word for a small rug. 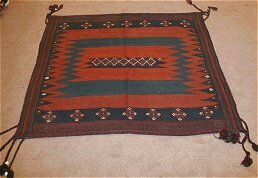 It refers to either the very narrow rugs woven by various tribal groups in Iran as runners, to fill in along the sides of large carpets in a room, or more commonly, to the almost square table rugs used on the floor as a tablecloth on which plates of food are placed. 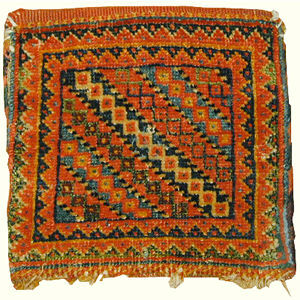 These eating cloth soufrehs consist of mostly a kilim (flatweave) square plain ground containing a square zigzag motif generally with a central medallion. A different weaving technique is frequently used for the borders, often a combination of parallel wrapping and extra cord reinforcement, (like this soufreh) or can have a knotted pile selvedge and ends. 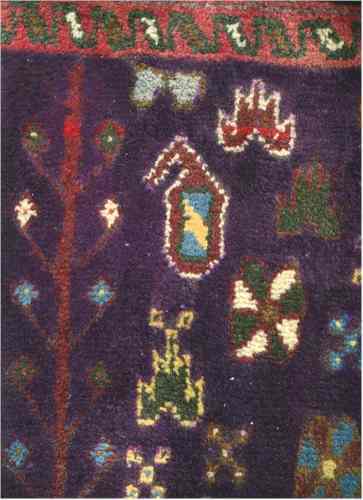 Occasionally the corners are decorated with tassels containing good luck beads or shells, but these are often missing on older examples. 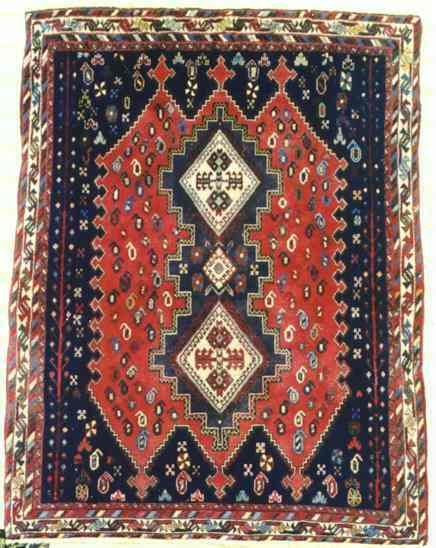 Soufrehs are woven by a number of tribes in Iran including the Afshar, the Balouch and some Kurdish tribes. 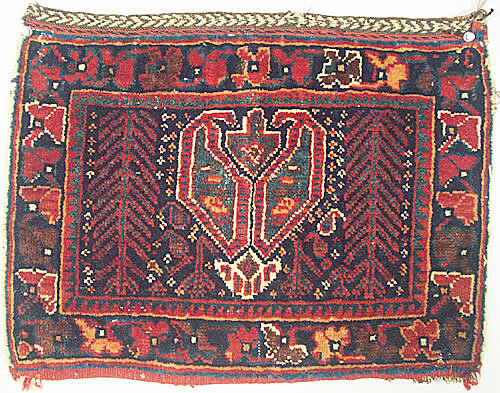 This particular soufreh was woven by the Afshar, one of the most widely dispersed tribes of the Turkic peoples, there being other substantial Afshar clans in Azerbaijan and Kamseh in the north west, Khorassan in the north east, Kerman in the south. The Afshar are still in Khuzestan in the southwest near the Zagros Mountains, where they originally settled after mass migration from Turkestan in the twelfth century AD. 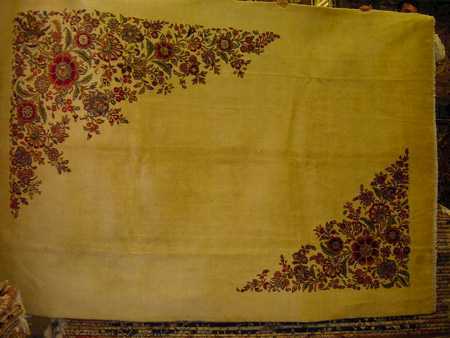 This piece comes from the market town of Sirjan in southern central Iran since it shows the mixture of white and blue flower motifs typical of the many soufrehs made in this town and its surrounding area. 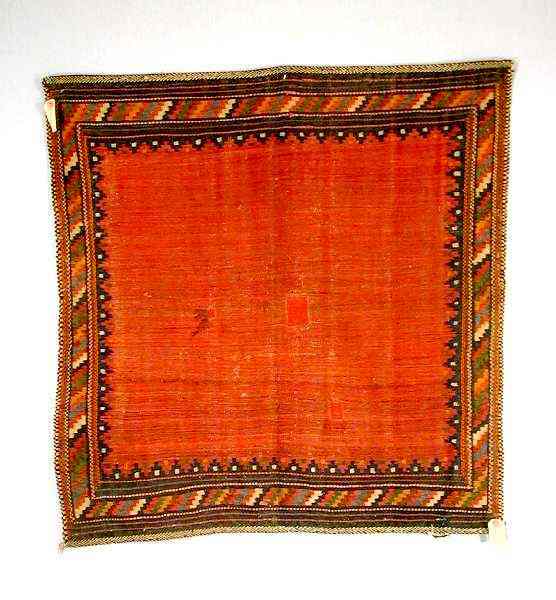 Because of their shape, eating cloth soufrehs like this one may be used on the floor, as a wall hanging, or even as a table cloth - its original function! The garden composition of this small bag face seems quite simple. But notice how the paired boteh that dominate the field assume a snake-like quality, appear to be confrontational and differ stylistically from those used as filler motifs. Cypress trees and delicately drawn flowers complete the garden scene. Sides: wool, re-cast. not original, but not reduced. main border guards intact. Ends: top end has original flat weave with strands of camel or animal hair. Comments: This bag face was probably woven in the early 20th century, however, the symmetrical knotting and the use of animal hair in the foundation indicates a likely nomadic rather than workshop source.